For those of you who don’t already know how good of a party a Laneway festival is, let’s talk acts. How would you feel if I mentioned the likes of Gang of Youths, Jorja Smith, Courtney Barnett, Rex Orange County, Denzel Curry, Jon Hopkins? Are you tingling at the thought yet? 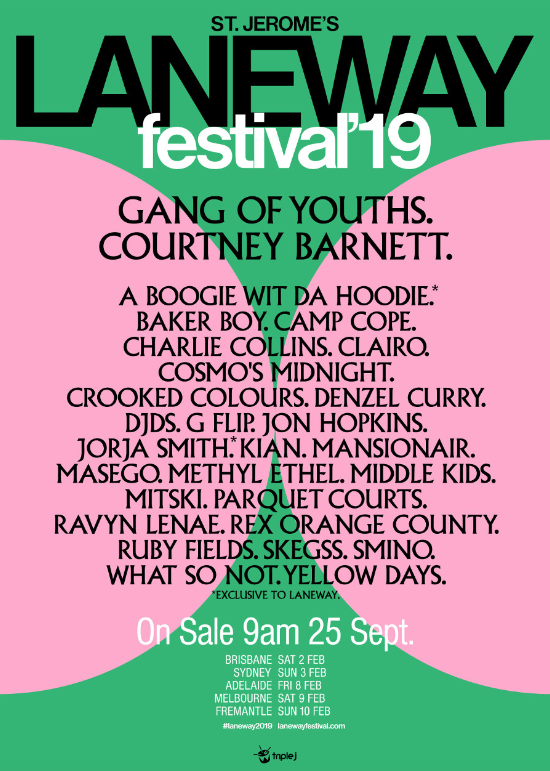 Always a guaranteed good time, the 2019 Laneway Festival prides itself on presenting the best new and revered musicians from around the globe. Their curated line up sets themselves apart from the hordes of summer festivals that punters have to choose from. With sponsors such as Jameson Whiskey, Absolut, Somersby and Jacobs Creek to sweeten the deal, start transferring the ticket money across and gather your crews around. VISA Checkout presale starts Thursday, September 20, followed by general admission on Tuesday, September 25. Keep https://www.moshtix.com.au/v2/event/sydney-st-jeromes-laneway-festival/106751?skin=sjlf_19 open in your tabs and clear you schedule; you just know this is going to sell fast.